On my way to work, I realise that spring is hesitatingly knocking on our door. Even though the changing of the seasons is an abstract notion in Athens, working in the northern suburbs of the capital, far from the city centre, has quite a few perks (if we exclude the fact that taking the Athens Tube and sitting side-by-side with an unimaginable number of idiots and low quality people lowers my IQ…) As I watch the tress acquiring life once again and the days lengthening, I can feel the sweetness in the air and this special weightlessness. Although spring is my least favorite season, the arrival of Easter gives me such joy that I can ignore the allergies and the irritating pollen flying and sticking everywhere. This anthology is my final stop on a beautiful journey curated by Melissa Harrison. Toads, swallows, hedgehogs, foxes, bumblebees, deer. Badgers, otters, magpies playing in the woodland while bluebells, mandarins, anemones, unopened buds in the night garden. Travel to some of the most beautiful corners of Great Britain: Cambridgeshire, Buckinghamshire, Hertfordshire, Cumbria, the Highlands, Bodmin Moor, the Yorkshire Dales, Chesil Beach, Oxfordshire, Suffolk. Take a stroll and enjoy the spring evening in the company of beautiful texts and extracts by famous writers and lovers of the flower season. A beautiful text on the coming of spring in the Highlands by Annie Worsley. Highfield, a beautiful poem by Alan Creedon. A moving text on fatherhood and the bond between the generations accompanied by the sweetness of the birdsong by Rob Cowen. A vivid description of the change of seasons in the North by Elliot Dowding, the thoughts of a teacher on children and baby owls by Nicola Chester and a beautiful confession of the isolation that has now become the companion of every city resident and the change most of us undergo when the opportunity to come closer to nature occurs. 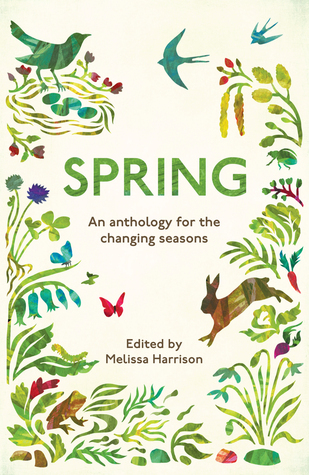 A joyous text on the coming of spring in the city by Melissa Harrison and an ode to Sakura, the cherry blossom, and the unique relationship between flora and the Japanese culture. It can be a beautiful season. A beautiful review, Amalia! Lovely review, Amalia. I’m a fan of Harrison’s fiction for her storytelling and her characterisation but my favourite bits are always her descriptions of the natural world. She obviously has an eye for other people’s nature writing. Thank you so much, Susan! I cannot wait to read ”Rain”. She is a wonderfully sensitive editor and her writing is so refreshing.